You need to buy yourself a holiday present. Yes, you do. The RUF CTR Yellow Bird is, hands down, one of our favorite air-cooled Porsche 911s. If the opportunity ever came to own one, we wouldn’t hesitate. There’s nothing wrong with taking a second mortgage, is there. But we also totally get that its yellow exterior paint isn’t for everyone. How about mint green instead? We thought so. Up for auction next month at RM Sotheby’s Paris event is this 1988 RUF CTR Clubsport, supposedly the only one painted mint green Its identical to the Yellow Bird, aside from the paint. 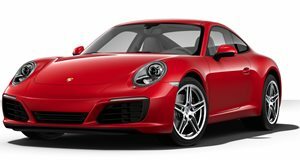 That means it’s powered by a bored-out, twin-turbocharged version of Porsche’s 3.2-liter flat-six, good for a total of 469 hp (a conservative figure) that's sent through a six-speed manual straight to the rear wheels. For the record, the 3.3-liter turbocharged engine from the same era was deemed as too heavy. Everything else on the Yellow Bird, including the aluminum hood, roll cage, engine cover and unique fenders and doors are the same. Interestingly, this car was originally a Guards Red 3.2 Carrera. Its first owner (German, of course) brought it to RUF for conversion to CTR specifications. That was in 1991, and in 1993 was sold to a Japanese buyer and remained there for years. It only returned to Europe in 2015 and immediately handed back to RUF for a complete checkup. Repairs were minimal, mainly just gearbox and turbocharger overhauls, which is pretty impressive considering its age and over 120,000 miles. Given everything, RM Sotheby’s 275,000-325,000 Euro estimate (without a reserve) doesn’t sound so bad. Photos courtesy of Morten Gjersoe/RM Sotheby’s.